without feeling guilty, and generally taking the time to soak up a little peace and serenity." Playing in the dirt is almost as therapeutic to me as running in the woods. Not quite, but almost. 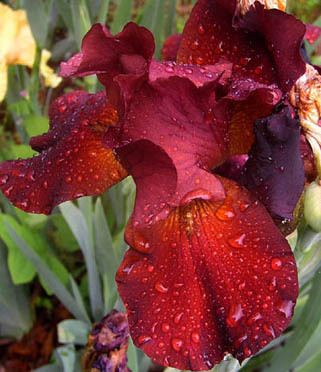 When I can no longer run, I'll still be able to indulge in my passion for gardening. I'm grateful that I was born to parents who loved to garden. It's in my blood. The only time in my life when I haven't had some sort of garden to tend was when I was in college. 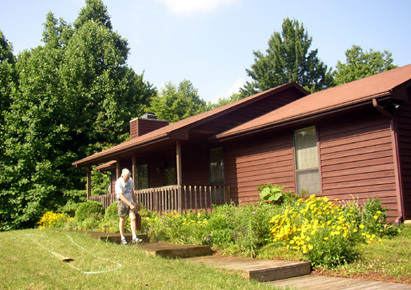 A few months after graduation I was able to buy my first house -- and begin tending my very own gardens full of flowers and shrubs (and occasional vegetables). Despite my grousing about battling weeds, I miss "playing in the dirt" when we are traveling. Jim and I "inherited" some large perennial beds from the former owners when we bought our Roanoke property in the spring of 2004. Some plants have died from drought and I've added a few others, but the beds look much the same as they did when we moved in -- or at least they do when we're here to keep them looking nice! They're a mess after we're gone for two or three months in the summer. We've had a vegetable garden only two of the five summers we've lived here. I'll talk more about our edible gardens and fruit trees in the next entry. I've stayed very busy since spring with our perennial beds. 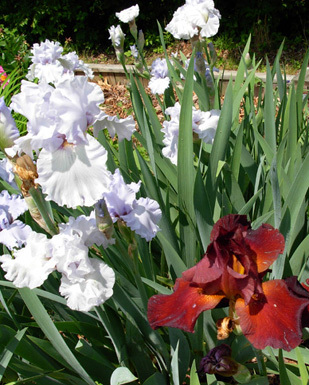 With almost-daily watering and weeding this summer, and occasional pruning, dead-heading, and dividing plants, I spend ten to fifteen hours a week keeping the beds looking nice. That's almost as much time as I spend running and cross-training! We've been rewarded with lots of beautiful blooms, compliments from appreciative neighbors, and happy butterflies, bees, hummingbirds, and other wildlife the past few months. 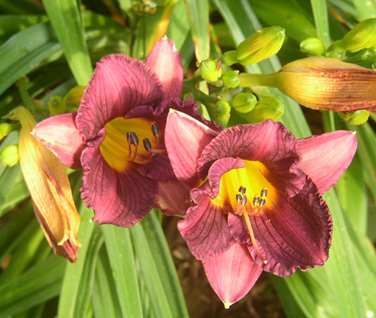 I love to take pictures of the beds and flowers. 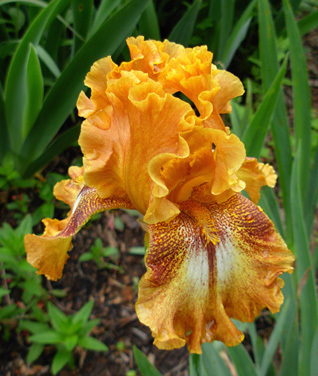 This entry will be primarily a photographic essay showcasing some of our flowers that have bloomed since spring. There are simply too many different kinds and colors to show in this one entry. As it is, I've included 48 photos here. I apologize to any of our readers with older computers and/or dial-up connections that may have problems with so many pictures. Just start reading the text while they upload . . . This is the first time we've seen a few of these plants in bloom since that first summer because we were gone from May or June to September the last three years. Add them to my list of "nice-REdiscoveries-while-we're-home-in-Roanoke-this-summer." For me, there's more truth than humor in that statement! 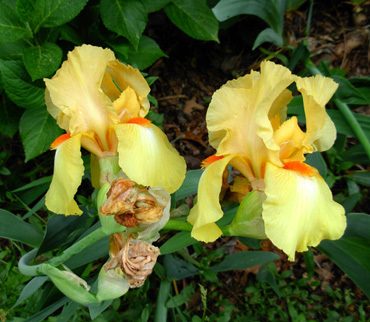 One of the problems of "inheriting" a garden that someone else planted is not knowing exactly what you have. Oh, sure, I can identify most any plant when it is in bloom, but just which little green sprouts that come up in April will turn into pretty bee balm flowers in July, and which are weeds that aren't welcome in my garden?? I've probably pulled a few expensive perennials out of our beds over the years, simply in ignorance. If I'm not certain it's a weed I'm pulling, I usually wait until questionable young plants get bigger to see if I recognize them as keepers. 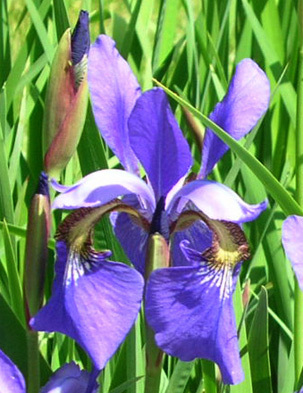 And yes, the desirable plants usually do come out of the ground much easier than the weeds! 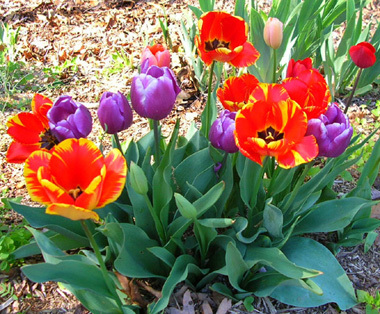 Tulips are easy to identify when they come up, so I'll never mistake them for weeds! 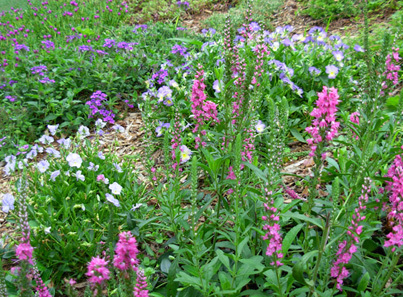 In our beds, weeding is most time-consuming in the spring when unwanted plants appear overnight after a good rain and seem to grow two inches a day. Gotta get 'em when they're young, before they multiply too rapidly. 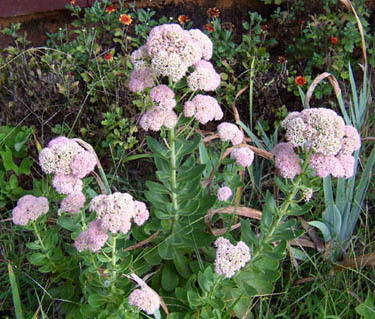 But even when it becomes drier in the summer, the weeds seem to thrive better in drought conditions than the coveted perennials and they need constant eradication. So it's a necessary task from about March to November in this climate. 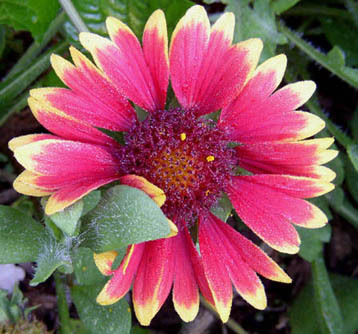 A WEED IS NOT ALWAYS A WEED . . .
You know what the definition of a "weed" is, right? It's very subjective. 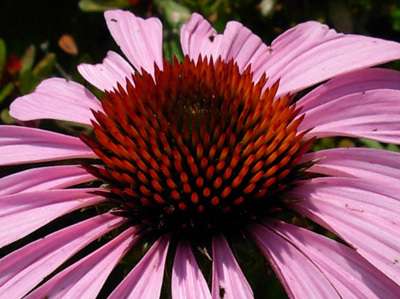 It goes beyond universal nuisances like dandelions in your lawn and poison ivy in your flower border, and it varies with each gardener. One man's weed is another man's carefully tended treasure. 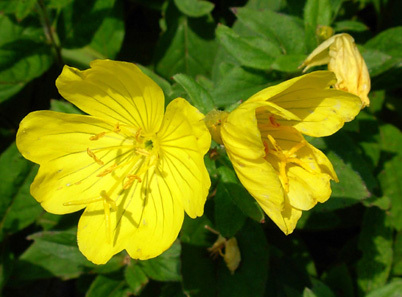 Any plant can be a weed if it's located somewhere you don't want it. For example, most folks don't want dandelions in their lawn but some plant them deliberately in a separate bed for their edible and/or medicinal leaves and roots. 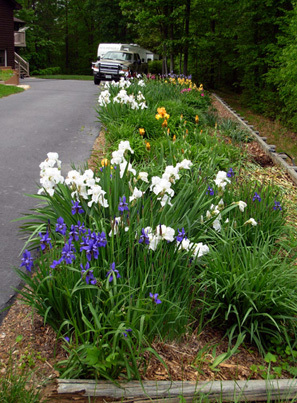 A friend was visiting the first spring we moved into our house and I was proudly showing off the flowerbeds. 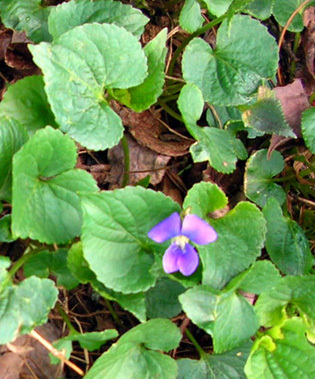 One was full of pretty violets (above), creeping phlox, and vinca in bloom. My friend advised me that I should remove all the violets soon or they would spread. She looked surprised when I told her I hoped they did! I love violets, and they're all over our perennial beds. It distresses me when they shrivel up from lack of water -- they haven't spread as much as I'd like! To my friend, they are weeds. To me, they are an attractive ground cover for nine months of the year. 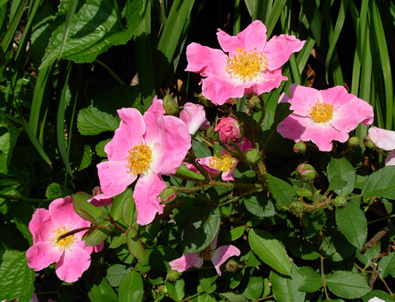 Many fast-growing, invasive plants are considered weeds because they rob the "desired" plants of water and nutrients and soon overtake them. Years ago I tried to establish dozens of fern-like crown vetch plants (next photo) at some property I owned near Atlanta for erosion control on the banks of a hilly, newly-graded driveway. The idea was good but the timing was not. There wasn't any water source nearby, and they died from drought. 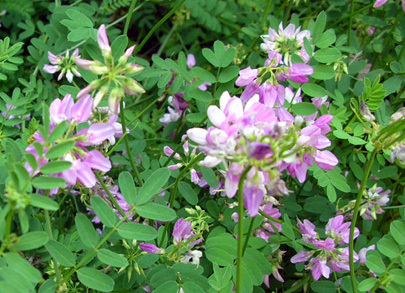 Eventually, "weeds" took over and held the soil in place, but they weren't nearly as pretty as the pinkish purple-flowered crown vetch would have been. Now I'm battling the crown vetch in our perennial beds in Virginia, trying unsuccessfully to eradicate the deep-rooted, tenacious plants. 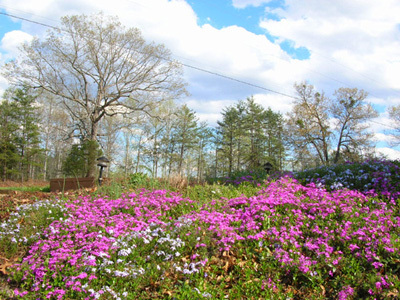 In this setting, I consider crown vetch an obnoxious weed that's trying to usurp my colorful flowerbeds. There's something to be said to letting it take over, however. If that whole bed along the driveway was covered in crown vetch, I wouldn't have to worry about it in the summer when we're gone! 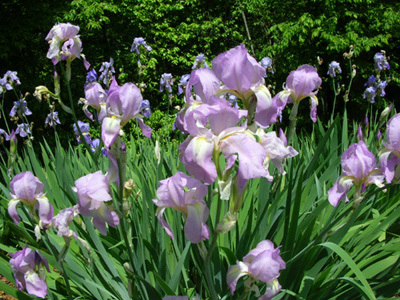 But we and our neighbors would surely miss the lovely tulips, daffodils, violets, irises, various types of lilies, spiderwort, coneflowers, roses, peonies, bee balm, asters, mums, and other beautiful flowers that occupy the bed from March to November. So for now, I'm still pulling up the crown vetch. I'll gladly share, if you want some! 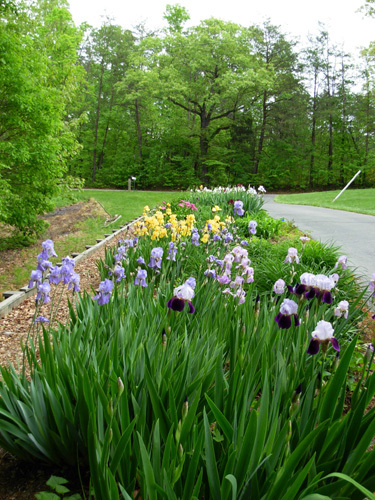 My favorite season of bloom in our yard is mid- to late spring when the irises are blooming. 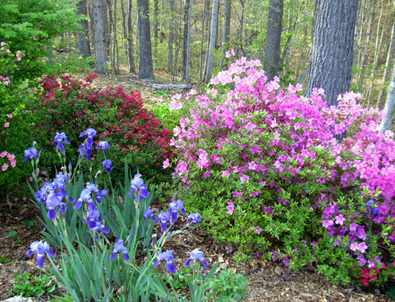 The former owners planted a lovely variety of types and colors. 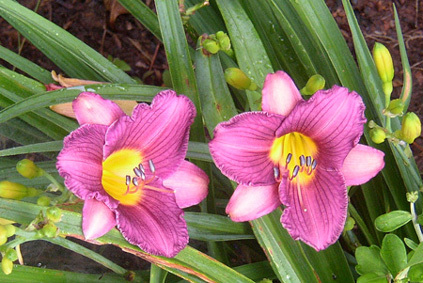 Like most bulbs and rhizomes, they have multiplied over the years. 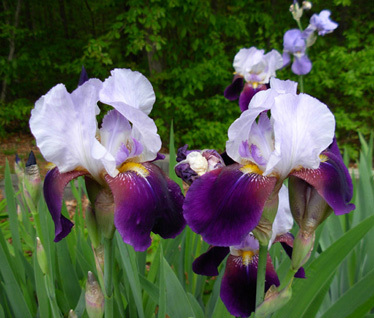 There are also irises in the beds surrounding the house and in the back yard. 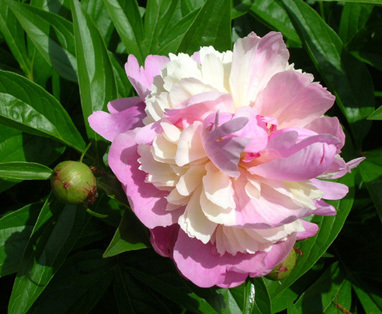 It's our most spectacular show of flowers when they are all in bloom! 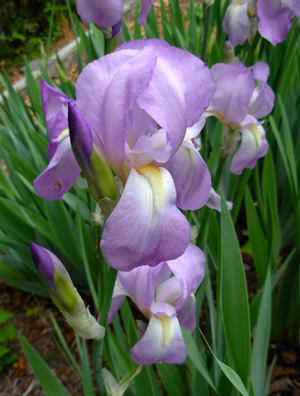 One of my chores right now is dividing the iris rhizomes and bulbs so they are less crowded and will bloom even better next year. Or that is the intended result, at least! I hope I don't mess them up. I have to dig carefully so I don't damage them. I'm adding compost to the soil where it's compacted, spreading out the good bulbs and roots, planting them shallowly like they're supposed to be, and tossing away the old, mushy ones that might harbor disease. 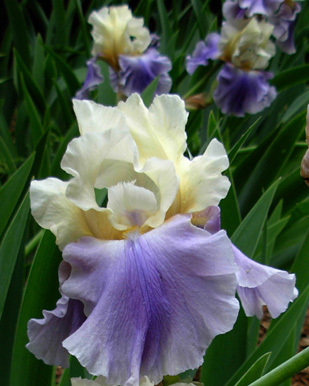 I appreciate them even more since I saw several growers at the Roanoke Farmers' Market selling bearded iris rhizomes for $5 EACH this spring! Now you know why I'm keeping them watered all summer -- we have hundreds of them and it would cost a fortune to even begin to replace them. 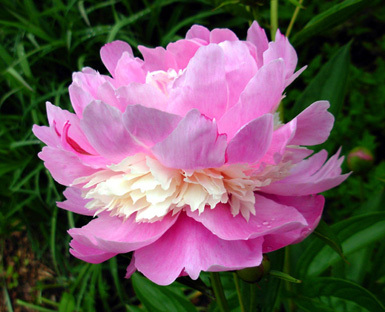 Peonies were one of my Mom's favorite flowers. These are the first I've had of my own, and I think of her every time I look at them. 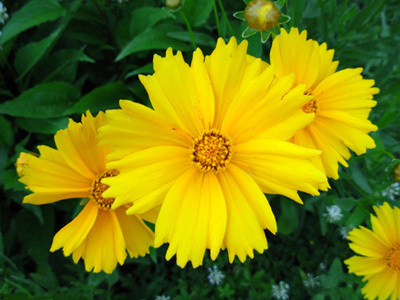 Until this year we've had lots of bright yellow coreopsis AKA tickseed flowers blooming in the flowerbeds across the front of the house in May and June, but not very many bloomed this year. They may have died in last summer's extreme heat while we were gone and they didn't get watered. 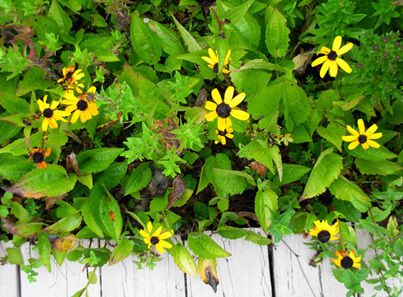 Coreopsis (above and below) in the summer of 2004; there are fewer now. 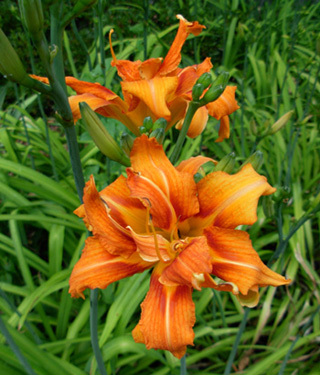 Although the roses and spidorworts usually continue blooming throughout the summer and into fall, the main show in June is produced by all the daylilies and tiger lilies the former owners planted. 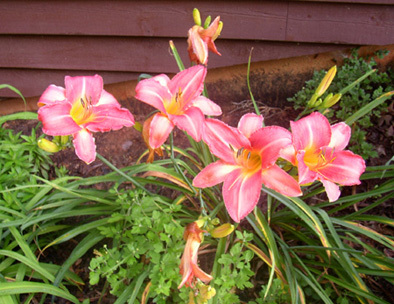 They weren't as showy this year as we've seen them before, and they sure didn't last as long because of the drought, but all the plants bloomed at least a couple of weeks. 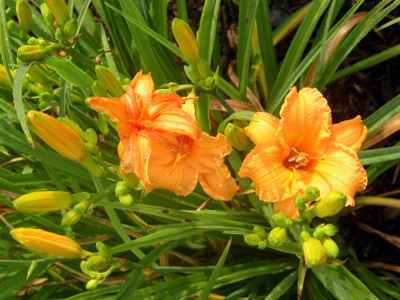 I don't know if they'll re-bloom this year if we get a drenching rain anytime soon. 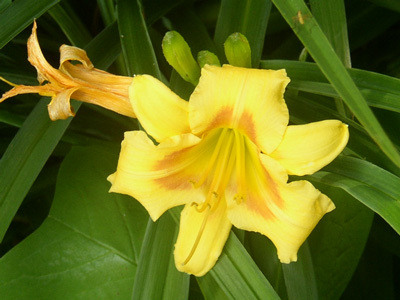 Daylilies are easy to maintain, they get bigger every year, and they continue putting out blooms for several weeks during June and July in our climate when the weather cooperates. 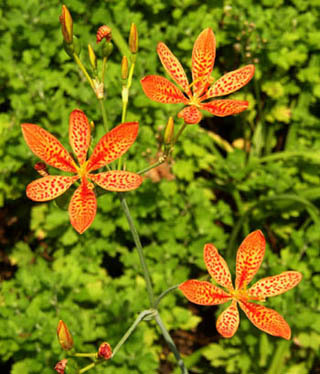 We have three other types of lilies in our yard: the standard tiger lily (below left), a very delicate, tall kind of lily that blooms in July (below right), and a slender cream-colored trumpet lily that isn't shown. Gardening does take a lot of time, energy, and sweat but the process and end results are well worth the effort for most gardeners. In a normal spring, I spend more time dealing with weeds than watering. Mother Nature usually provides adequate moisture at that time of the year. This summer has been very dry since the middle of June, however, so more of my time has been required to water the beds than weed them. Real rain is much better, of course. Unfortunately, it's been in real short supply at our place this summer. Our area is 8-12" low on rain this year, mostly from the last three months. 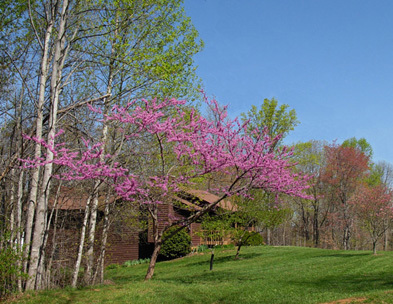 Our front lawn is brown, even crunchy, and some of our ornamental and natural forest trees are looking wilted and losing leaves prematurely. 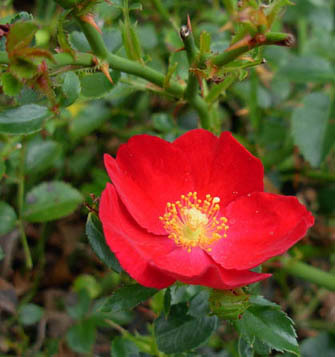 At least I'm keeping the flowering shrubs and perennials alive by watering them deeply once or twice a week. 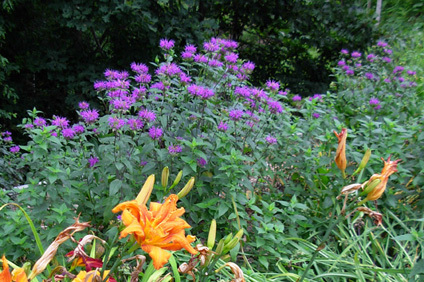 When I look at our photos from the summer of 2004 I realize our perennials aren't blooming nearly as long this year. Some things that were flowering in September (e.g., coneflowers), October (hydrangeas), and even November (those roses, above) appear to be done flowering now, in mid-August. 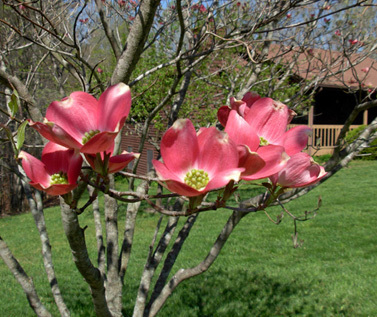 I've begun watering the pink dogwood and peach trees so they don't die. None of this gets done when we're gone all summer, and we've lost several types of plants to drought when we've been gone. The wild critters with whom we share space (deer, turkeys, rabbits, squirrels, hummingbirds and other bird species, butterflies, bees, insects, moles, snakes, turtles, etc.) 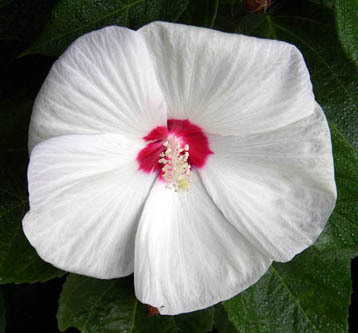 appreciate the wet dirt, leaves, fruit, and flowers because their natural water sources -- puddles, water on leaves, our two little creeks -- are all dry. I'll have more about the gardening challenges wildlife creates in another entry. 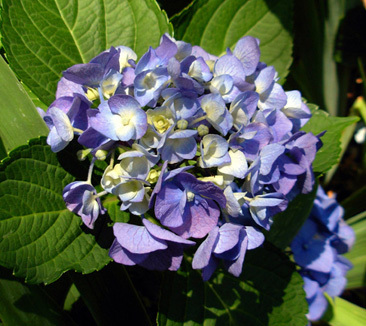 Some other flowers we have that begin blooming in late spring or early summer and last until fall are lantana (an attractive purple groundcover shown below),	delicate wild geraniums (pinkish lavender), blue balloon flowers, and ice plant (low-growing succulent with bright purple flowers -- see photo in the critter entry). That's one of several gardening quotes I found that also apply to running. Actually, this one is more true for me regarding running than gardening. I don't usually do enough sustained aerobic exercise in the yard to produce endorphins like I do when I'm running or hiking, but playing in the dirt can certainly be relaxing and refreshing -- very therapeutic, in fact. I need endorphins for most of my creative ideas and solutions, however, and those come with walking hard or running. 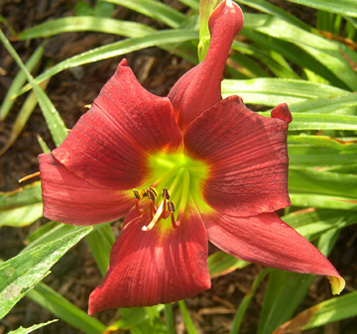 Right now in mid-August many of our flowers have stopped blooming as profusely as they did in June and July. The sustained drought and average daytime temperatures in the upper 80s have taken their toll on the garden. Friends who've lived here all their lives tell me not to worry. They see this almost every summer. They assure me that if we get some good soaking rains in August and September (usually hurricane remnants), the grass will turn green again overnight and many of the flowers will come back. I have my fingers crossed real hard for some good soaking rains . . .
brownish pink in the fall. 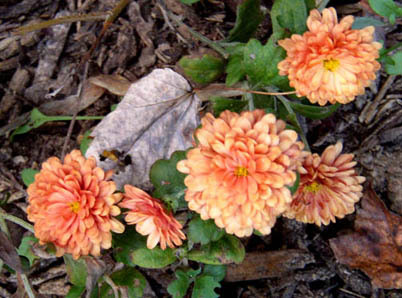 Those are mums in background. 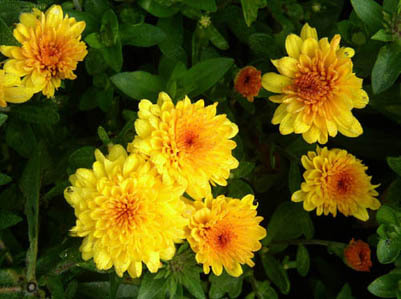 We have almost as many colors of mums as daylilies, including white, cream, yellow, gold, salmon, orange, brick red, lavender, and purple. Two colors are shown below. 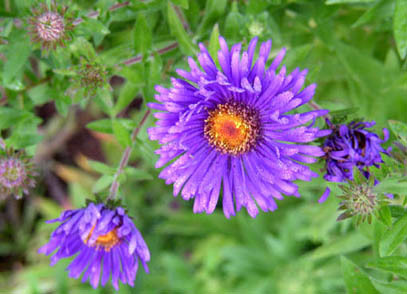 Some of our mums and asters, which are in the same family, started blooming in early August. If we get some good rain, they should last through most of November in our climate. There were some mums here when we moved in, and I've added more over the years. 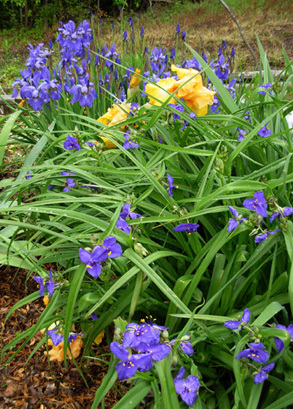 The former owners planted lots of blue/purple and yellow/gold flowers that bloom in the summer in the large bed across the front of the house. Complementary colors like this (i.e., directly across from each other on the color wheel) are a pleasing combination and contrast nicely with the dark brown siding on the house. 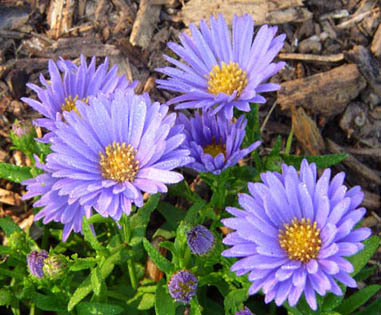 The two main types of asters that we have are pictured below. 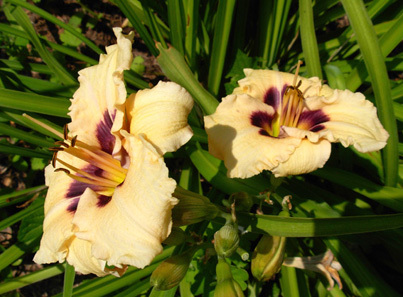 The tall, fringy variety (second photo) is more predominant in our beds -- it multiples easily. 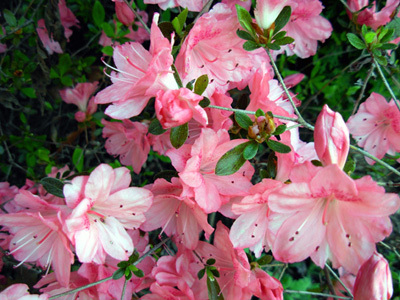 The show continues through autumn and into early winter with some of the flowers above, as well as two shrubs, Encore azalea and camellia, that begin to bloom in October or November. If I can remember, I'll show them in an entry later on when they start blooming. Absolutely. There's another quote that can apply to running just as easily as gardening. I guess I just have an addictive personality, because there are lots of positive things I am passionate about, including running and gardening. Most of my interests involve physical activity, nature, or art. That's a good thing, because they keep me out of trouble with negative addictions! Next entry: our small but bountiful edible garden and "orchard"